I love impulsive shopping. Especially when something is in my head telling to go buy that. Even more so when it is something I will use over and over again. Like another lip gloss which is a tenth of a shade different to the one I bought the week before. Do you understand what I am getting at. 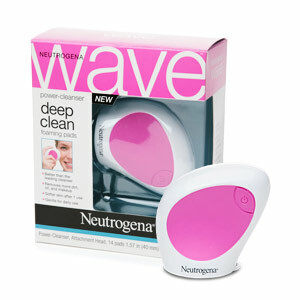 The Neutrogena wave is one of those purchases. Except I normally use a standard cotton pad and cleanser of choice. Anyway the Wave is best described at a vibrating cleaning pad. You are supposed to take one of the cleaning pads and attach it to the Wave. It has a Velcro like texture to hold it securely. You then wet it with water, switch it then glide over your face. The adverts I have seen show loads of foam. I know TV will show you anything. I do not get much if any foam at all. However it does clean my skin nicely. My skin feel gorgeous afterwards. I have only tried it on skin laden with MAC Studio Fix powder. I must try it with my Iman or Fashion Fair cream to powder foundations to see if it truly works deep down in them pores. The initial cost was £9.99 from Boots on promotional offer. The Wave includes 14 cleaning pads, so I purchased a refill pack £3.99 that has 30 cleaning pads. I know recession times means this will be one heck of an expense to maintain. So I am going to see if I can use a standard cotton pad with my own cleanser to see if I get the same results. Will see. Check out the Neutrogena site. Reply	Nicole ♥ HealthyKisses Inc. I tried this and I liked it, until my doc prescibed me some cleanser…had to let her go 🙁 lol. oh no. i am just glad that i am not the only one who finds it good.